Above is not two pictures of two telescopes, but two pictures of the same telescope taken almost 40 years apart. 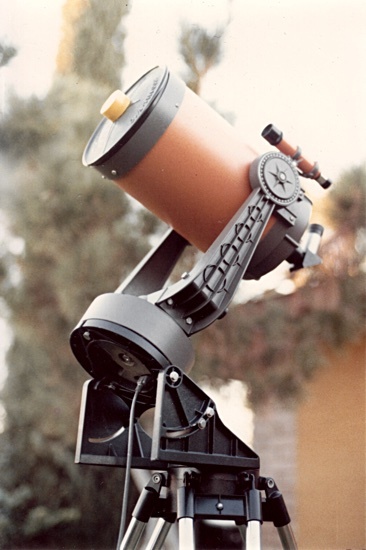 In 1979 I bought a brand new shiny Celestron 8 telescope at a camera shop in a mall in the Phoenix, Arizona area. For cash, according to the receipt. The afternoon of that day I took the first picture. In 1994 I sold the telescope to a friend as part of the selling-everything-I-own-and-sailing-off-into-the-sunset portion of my life. In 2017 I bought that telescope back from the same guy and took the second picture a couple of days later. I had no idea I'd ever see this telescope again. For a couple months I'd had visions of getting a nice C8 OTA (optical tube assembly), putting a dovetail on it and using it on my Losmandy GM-8 mount. 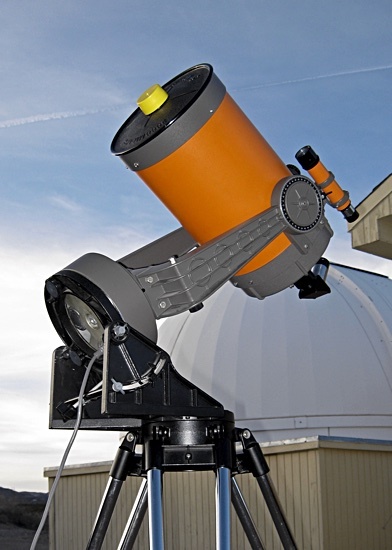 The GM-*8* mount was originally designed for a Celestron *8*, so it seemed like a good match. When I was contacted about this one I ordered the dovetail right away. When I saw this one a couple of days later that all changed. The scope and everything that went with it was in PERFECT condition. No funny discoloration of anything. No chips or scratches. No rust. Nothing. It was all in the same shape it was in 20 years earlier. There was a lot of dust inside the scope, but this is New Mexico. I'm surprised there wasn't more. When I finished going through all of the parts and looking everything over I sat quietly on the floor and wept with joy. OK, the sitting on the floor part is true, but that other part really didn't happen, but I did decide to not pull the telescope tube from the fork mount ("defork it") and break up the set. I decided to keep all of the original parts together and keep on using it that way for special occasions. 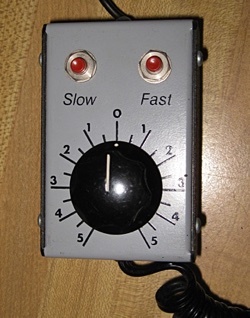 One part that still worked was the AccuTrack speed control. I was surprised. I plugged it into an outlet at home and there wasn't any smoke, screaming, passing out or sirens. Just 60Hz humming. 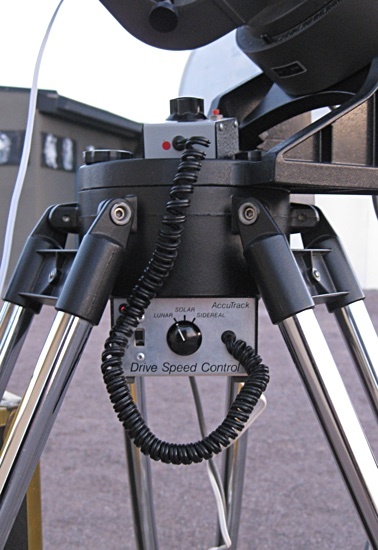 The C8 had two synchronous AC motors for telescope tracking. They only ran at one speed using the 110-120V 60Hz AC wall outlet power. 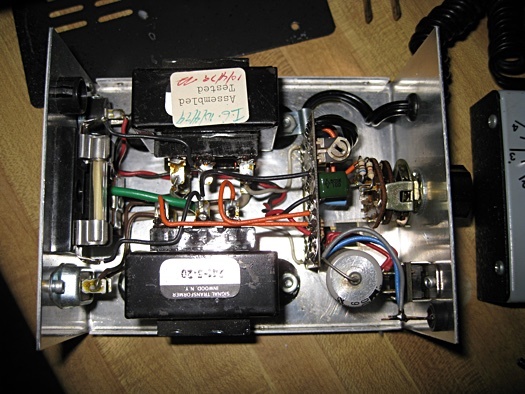 This AccuTrack unit produced AC power that wasn't 60Hz, but several different frequencies. 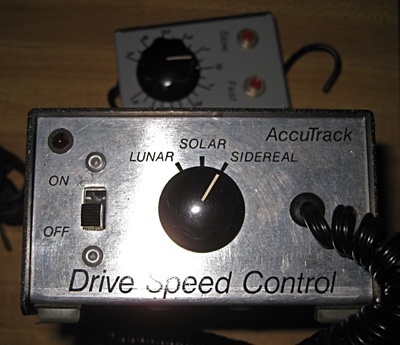 Each frequency was set to drive the motors at the right speed to get the usual lunar, solar and sidereal telescope tracking speed rates. With the hand paddle you could scan back and forth in right ascension using the Slow and Fast buttons. The dial was used to fine tune the speed. All of this was analog, so it wasn't unusual for the frequencies to drift off a bit. There was also an old DewZapper heating band included with all of the parts that went right from an AC power cord to a rubberized heating strip. I couldn't remember how long ago I'd bought that. The cardboard box looked really old. I decided not to plug that one in. I'll just get a new heating band to fit the C8 for my Dew Not system controller that I use with my other scopes. Just look at those nice transformers and capacitors and wires. They all still worked great after being put together on October 4th, 1979. I like that. I'll hook it up to a frequency counter at some point and tune it up. The controller was made with the Celestron tripod of the day in mind. There was a threaded hole in the top of the case and you placed a long threaded bolt down through the middle of the mount and tightened the controller up and out of the way. Simple. 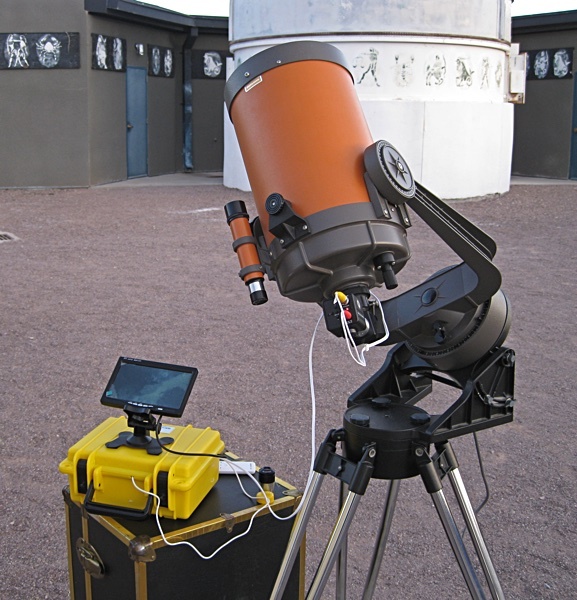 The regular telescope AC power cord plugged into the back of the controller, and then you powered up the controller with regular AC electricity or with 12VDC power from a battery. Before I got the drive system running I hooked up my Revolution Imager 2 video camera system. I'd had it for months, built a box for it way back when, but had yet to try it out! 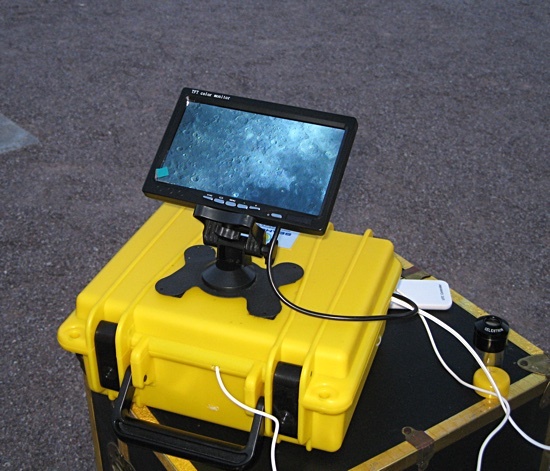 I wanted to see how it would be with this scope for the purpose of using it all for outreach events. This C8 system is way quicker and easier to set up than my other stuff for something like that. There's also not a lot of wires hanging around for people to get tangled up in, and with using the video camera there's not even anything for them to touch. Well it looks like it worked to me. The C8 is a 2000mm focal length lens. That's pretty far into the telephoto department which would thechnically be anything over 50mm in the 35mm camera universe. The CCD chip in this camera is not very big. Those two things combined produce a fairly magnified view of the cosmos. In this setup it took about 3-4 widths of the display to cover the diameter of the Moon. That's a bit zoomed in for outreach stuff, plus if the seeing is not great there will be a lot of 'shimmering' of the image -- which there was. Every instability in the atmosphere gets magnified along with everything else. The camera comes with a focal reducer that would have helped that situation a bit, but I forgot all about it unitl I was packing up. Next time. All-in-all it all worked well. Everything did what it was supposed to do. Before I got the drive system running I was able to just point the telescope and then watch the Moon slowly drift across the display. That was nice. 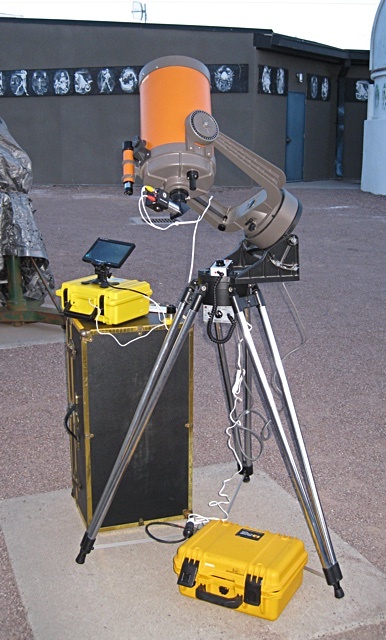 I powered the telescope drive off of my regular power/battery box which is sitting on the ground, and used the telescope case for a table -- because I forgot to bring one of my little tables with me. I tweaked and messed around for about an hour and then packed it up. The clouds were getting too thick. By the time I got the camera swung around to M42 in Orion it was just a blob, but there was plenty of blob to it, and it filled the whole display. Other than the really new stuff in the picture above the only equipment that is younger than 30 years old are the rubber feet on the bottom of the tripod legs. I just got them. Four cane or stool tips. $2.99 at Ace Hardware. The next event for the scope will be to disassemble everything, clean, relube, adjust, and put it all back together. That will be fun. I had this telescope for about 15 years the first time around and used it quite a bit. Everything is still there, and it all still works. Having it around again is going to be nice! Now if you'll excuse me I have to go trolling for another telescope since this one is going to remain intact.